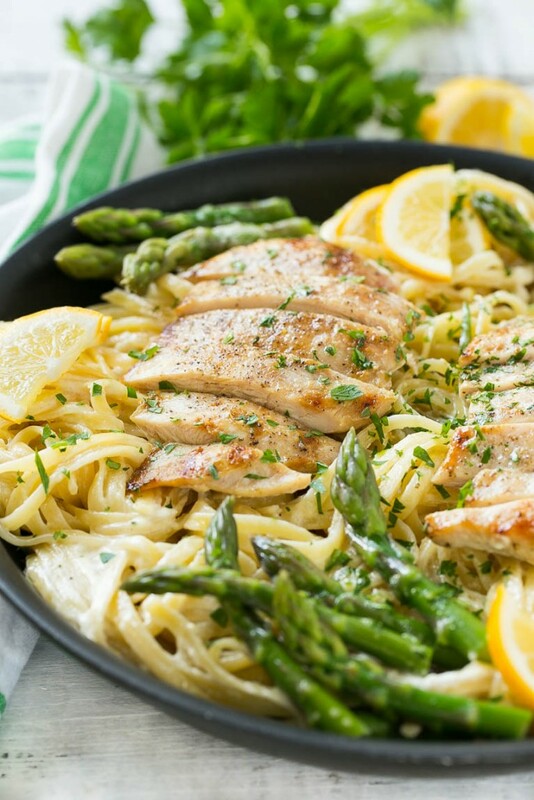 Lemon asparagus pasta is an easy all-in-one meal that you can make tonight. Lemons are still in season and asparagus is just starting to come in. I had bought a few bundles the other day because it was down to $1.47/lb. I was going to make asparagus soup in the Vitamix. But instead I tried this out. You can find the full recipe at Dinner at the Zoo. I love how the author offers quick substitutions such as using rotisserie chicken if you’re in a hurry. If you didn’t want to use cream, you could use low or non-fat milk. There is also fat free half-and-half. But that always sounded so weird to me. You could use powdered milk in a little low-sodium chicken broth. Cooking Light published a recipe for a heavy cream replacement that uses chicken broth, brown rice, and 1% milk. I would also consider adding in some mushrooms. I love mushrooms mixed with asparagus and lemon cream sauces. You could also add in some red onion for a bit of a bite. Also, if you don’t have lemons, swap in dijon mustard for a creamy mustard sauce. It will work well with the rest of the ingredients. I don’t think I’d make it a honey mustard cream, though. It’s probably just my palate but I don’t like the idea of sweet with asparagus. Generally, Paleo does not include grains or dairy. So you’d need to use ghee and almond flour for the sauce, and serve it over zoodles or spaghetti squash. I thought about recommending creamed tofu, but there’s a lot of controversy surrounding tofu and if it’s unprocessed and non-GMO. For low carb, enjoy the cream. And definitely, serve it over zucchini noodles. You can’t get too many vegetables. And the zucchini will absorb the flavors of the lemon, cream, and asparagus.